I am the first person to admit that I’m not much of a DIY person, but from time to time I get inspired to do a project, and I totally love how this one turned out, so I figured I should share it with you guys. At first I was just thinking of doing a chalkboard wall, but once I learned about the existance of magnetic primer, I knew that was the route I wanted to go. Thankfully my husband was on board, and once we picked out a wall to do this on, it was game on! It’s magnetic! Everyone is surprised when they see that it’s not just a chalkboard wall. It takes up ZERO floor space. Nothing to trip over or continually have to pick up in our small living/dining area. Awesome! Cost – it was cheap! $50 for a gift that keeps on giving & will grow with the kids! $10: (It was $0 for us because we had these items already in our garage: Paint roller, roller covers (we threw the one used for the magnetic primer away – that was some nasty stuff), paint brush, masking tape. Mix the magnetic primer VERY WELL so the magnetic slivers are evenly distributed when you’re painting. We had the store shake it up in their machine, then brought it straight home and started painting the 1st coat. After that, we shook & stirred it very well before applying each additional coat. Do as many magnetic coats as possible, letting it dry for at least 30 minutes between coats. We did 4 coats and used the entire can. Every coat you apply makes the magnetic hold stronger. Do this step on a day when you can open your windows and doors and keep the kids away. It was FOUL smelling for hours after doing this step. 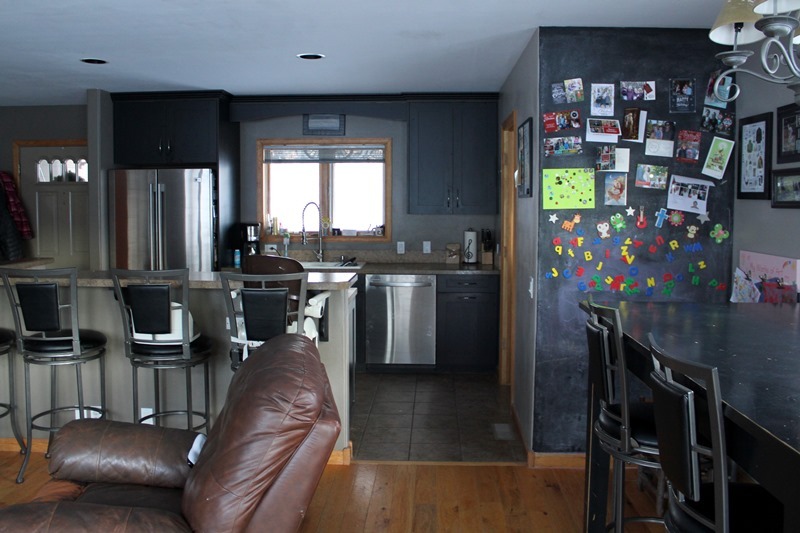 Do 2 coats of chalkboard paint…and make sure you wait the full 72 hours for it to cure before using it! Chalkboard paint on — just waiting the 72 hrs for it to cure. Don’t forget to prep the board before you use it so your first drawing isn’t there permanently. Simply lay a piece of white chalk on it’s side and rub it all over the entire wall. Rub it in with a soft cloth or paper towel, and then erase completely. Ignore the naysayers & give your kids some credit! Some people in our lives poo-pooh’d the idea saying we were teaching our kids to write on the wall. So far Stella is great about understanding that she can only draw on the chalkboard wall and not on the other walls in the house. Daddy & Stella christening the wall with it’s first drawing! Hanging out in their art corner. If you have a textured wall (most are), the chalk wall doesn’t erase completely to black because the white chalk your prepped it with gets stuck in the texture holes. (DUH, I just never thought about it). You can “fix” this by sanding down your sheetrock to a smooth finish before you start the painting process, but since this wall probably won’t be chalkboard forever and we’ll repaint it to match the rest of the room someday, even if we knew this ahead of time we wouldn’t have done anything different. We should have done the magnetic primer all the way to the ceiling. Our thinking was to ensure the center part was really magnetic (where the kids play), but it would have been worth our time (and $20 for an extra can of primer if needed) to extend the primer the entire height of the wall. Now that we’re using the upper portion for Christmas cards, I’m bummed the magnets won’t work for the top 12″ or so! Paint the wall flat black whenever we are done with the chalkboard feature in a few years to make the magnetic wall look a little more polished. $12: Really strong magnets. The wall is magnetic and our regular kids’ magnets work great on it, but if you want a magnet to HOLD something like a child’s artwork or Christmas cards, you need stronger magnets. Based on reviews I read on other blogs, I picked up a couple rolls of neodymium magnets from Amazon. These are NOT child friendly (definitely a choking hazard) so I keep them up high out of the kids’ reach. They work great though! $11: Melissa & Doug Magnetic Wooden Alphabet. We already had these actually, but they work great on the new wall and look awesome! It’s a full set of upper and lower case letters (so 52 in all). As the kids grow, I’m sure they’ll love to make words more and more. Animal Magnets: I don’t remember how much these cost, but they were super cheap. Two years ago I bought the wooden animal cutouts at Wal-Mart and a roll of magnet backers to stick to them. The kids love them! Free: Sidewalk chalk. Some kind soul bought buckets of it for the kids to use on the sidewalks in town park during Jaime’s memorial service last spring. Somehow it all ended up back at our house, so we have enough chalk to last for years! So there ya go – my very first DIY post on this blog. 🙂 Is there anything I forgot to cover? Has anyone else done something similar and have any tips for others? Very nice. 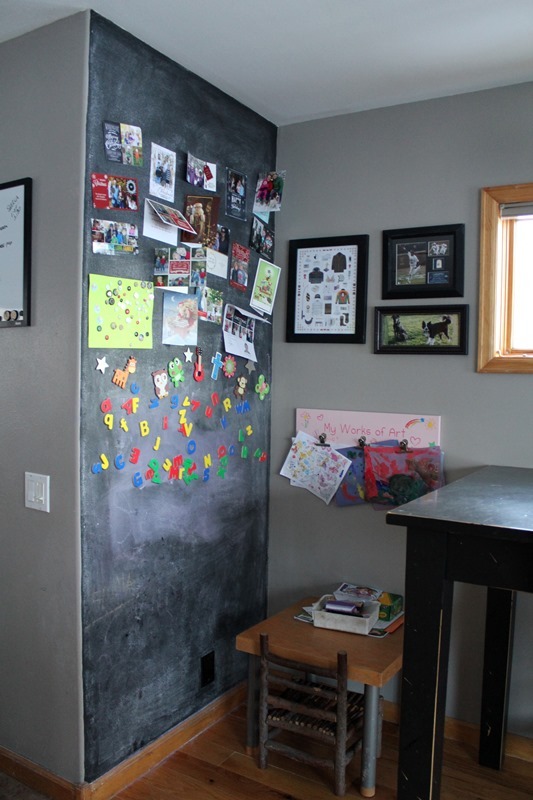 We have a chalkboard wall and a magnet wall in our play space in our basement and it gets tons of use. I love the “zero footprint” aspect of it as well. We have a tiny house with no playroom, so space is definitely a premium. This is a nice way for the kids to play near us without it being a ton of toys on the floor. Love this. I wanted to do it and didn’t because I was warned about the textured walls. Now, after reading this thinking of doing it after all. Does it bother you to have it in the holes after you erase? 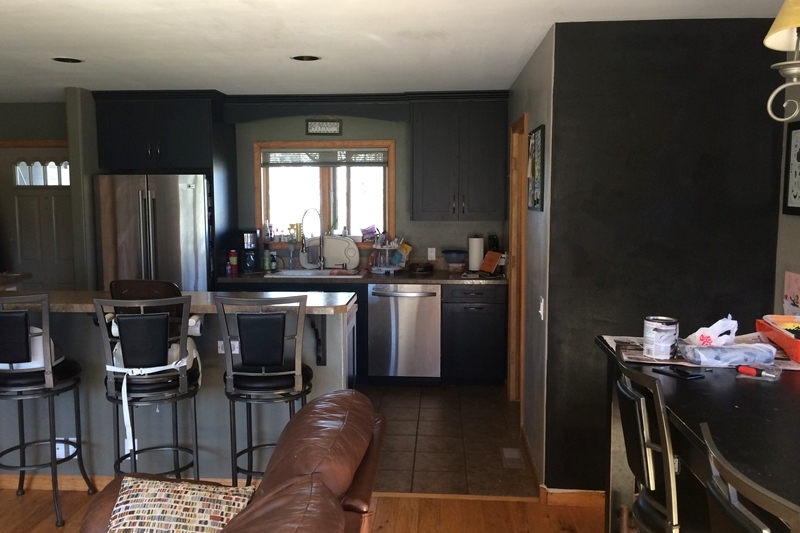 It bothered me the first couple of days b/c I wanted it flat black and “clean” looking… but now I honestly don’t notice it, and the kids love it, so I’m definitely glad we did it. Very cute! It turned out great!! Well done! I hadn’t heard of magnetic primer… Interesting. I made a magnet board for Matthew 2 years ago from a huge oil drip pan and I’m still proud of that. DIY projects are fun, but scary because you never know how they’ll turn out! Yours turned out great! This is the perfect location for that type of wall! We are getting the letter magnets for Christmas but they’ll just go on our fridge. I hope I don’t regret that. It’s nice that your space is a little out of the way. Great tips, thanks for sharing! Our fridge isn’t magnetic, so we had to figure something else out for Christmas cards! And, just to be Debbie Downer, I have to remind all your readers that if kids swallow two or more magnets, they can stick together inside them and cause VERY serious issues. I worked at the children’s hospital in this article when a few cases happened, and I will never forget it. http://www.npr.org/blogs/health/2013/08/08/210200382/swallowing-tiny-magnets-can-lead-to-big-trouble-for-kids I know you know, Josey (especially since I’m almost positive I commented about it before – I’m obsessive.) But for anyone else reading who may not know, I just wanted to suggest choosing great, big magnets that kids can’t swallow. I certainly hadn’t ever thought it before hearing about it! I know 🙂 That’s why the big animal magnets are down low, and the little ones are up high. Those things are SUPER strong and hard for me to even get off the wall! I feel like you guys dyi all the time! Charlie is so handy. I can think of your magnet board for Stella’s room for one! That was awesome! So is this! Nicely done! Don’t you wish you had all the “after” tips and tricks for yourself before you got started? I always learn so much through the process. I might have to try this! Love the magnetic aspect. I bought the boys one of those IKEA easels with a whiteboard on one side and a chalkboard on the other. Disappointed that it is not magnetic as our fridge is not either. Mrrrrp. My question is – what is the chalk dust situation? On the floor and on the kids? The boys get COVERED head to toe in chalk dust when drawing with sidewalk chalk on the driveway. Fully admit to not giving them chalk for the easel yet.